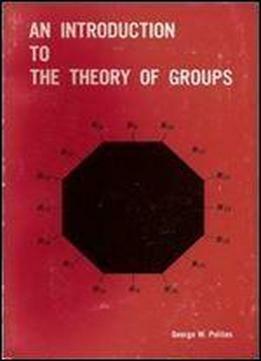 It is to be emphasized that this book is intended as an introduction to the theory of groups. It is hoped that a reading of this book will create a great deal of interest in the subject of groups, and that the reader will prolong this interest by continued reading in many of the fine books that go into the theory in much more depth. It is to be emphasized, too, that familiarity with and a knowledge of most of the material here is essential to a further study and understanding of the more advanced topics and specialized material on group theory. The primary motive for the writing of the book was to provide a text for the study of groups by students engaged in independent study or honors work. It should also do very nicely for use in a special-topics course in mathematics, or in a mathematics seminar. It is directed mainly to the advanced undergraduate student and should provide enough material for a three-credit-hour course. The book also may have appeal for many graduate students as a reference, or as a supplement to a text in abstract algebra. Finally, it should be stressed that most of the exercises in this book are of extreme importance and should be studied closely. Many results found later on in the text depend strongly on exercises that may occur much earlier. The examples also should be carefully noted, and the reader should try to construct others in addition to solving the ones given.